The first finish was the margarita, of course! The owl hat, not-so-much! My laptop seemed much more interesting than sewing on eyes and beak! 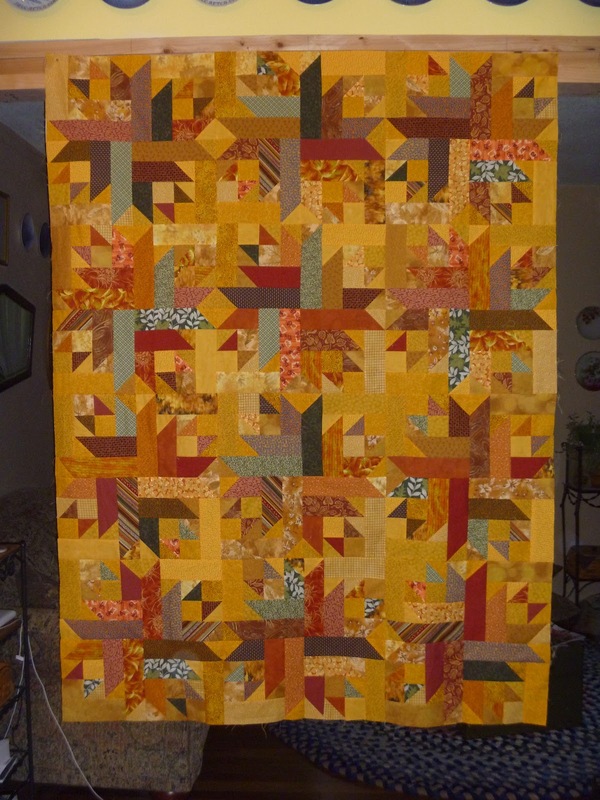 Yesterday afternoon I worked on sewing together the rest of that quilt that I had started and set aside. Well, it isn't totally finished as it needs borders but I do like how it is turning out so far. The pattern is Nova from the book Scrap-Basket Sensations by Kim Brackett. The pattern in the book uses more of an off-white for the background but I wanted more of a fall feel so I used golds instead. I was a little nervous as I was putting it together thinking it wasn't enough contrast but it turned out well which is a good thing since I cut out another one when I cut this one! My husband and I went out for dinner last night and then stopped at Home Depot for a couple of items. We wandered back to the bathroom vanity and kitchen cabinet sections. We have started talking about redoing our bathroom as it needs some new paint and other updating. I think we are going with hickory cabinets and right now the kitchen in-stock cabinets are on sale and we want a pantry cabinet for the bathroom so I think that will happen before the sale ends and then the vanity and other items will wait until we are ready or it goes on sale! I was fairly tired last night but after laying in bed for almost an hour I just wasn't sleeping so I got up and headed to the sewing room. 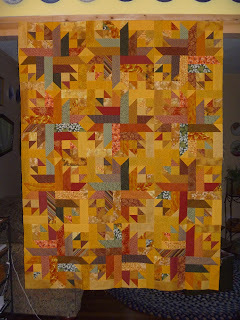 In two hours I got a back ready for one quilt so I can baste and quilt it today and then cut out 3 more quilts. That means I will have at least 9 quilts I can work on at the retreat. I might also get the border fabric for the above quilt and have that to work on also (unless I get it taken care of before I leave). That quilt turned out great! I love it!